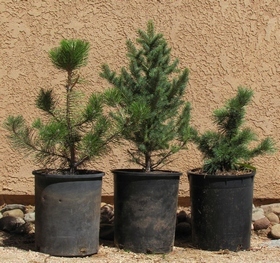 Blue Spruce: 18" - 36"
Bristlecone Pine: 12" - 30"
Austrian Pine (limited quantities): 18" - 24"
Nursery trees are to be picked up at the mill or Black Forest site. Delivery may be available for large orders. Planting services available. Please call us for details! This is a superb evergreen conifer with rich blue coloring, depending on the individual plant. It has dense branching and a pyramidal form that makes a wonderful living Christmas tree and an excellent landscape specimen. It is known for its extreme hardiness, and it grows in practically every town in Colorado, from the plains to timberline -- and is grown across the nation and the world in latitudes with colder winter temperatures. It is tolerant of drought and very moist conditions, and very hot to very cold weather, and will thrive best with medium, deep watering. Full sun is best, but it will grow in the shade. This is also a superb evergreen conifer with variable rich blue-green coloring. Grown in full sun with plenty of spacing, it will form a tree with dense branching and pyramidal form, making a wonderful Christmas tree and an excellent landscape specimen. White fir has soft, long, blue-green needles, and forms very unusual upright cones at maturity. 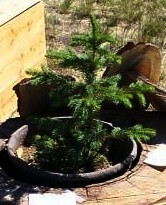 It is less tolerant of extreme environmental conditions than blue spruce. Named after David Douglas (1798-1834), a Scottish botanist, this western American species grows from Colorado to the Pacific northwest, and is known for its majestic form. In Colorado, its light green to blue green coloring, light to dense branching, and pyramidal form make it an excellent landscape specimen. It thrives best with some shade, especially in the early years, but will do well later in open sun. At planting, some southwestern shade is recommended. Named for the species� ponderous size at maturity, this tree grows in drier sites and poorer, rock and gravelly soils all over the west. Its hardiness makes it a goodchoice for open sun planting where watering may be less than optimal. It will make a superb evergreen with dense branching and a pyramidal form during its growing years, through 30 years of age, and then form a forest-type specimen. This native of Austria looks very similar to ponderosa pine, but grows thicker needles and assumes a beautiful dark green color and classic pine tree shape. It is a favorite landscaping tree in Colorado towns and cities. It does best in full sun, and is drought-tolerant. First, call us at (719) 783-4250 to discuss your location and what you would like to plant. 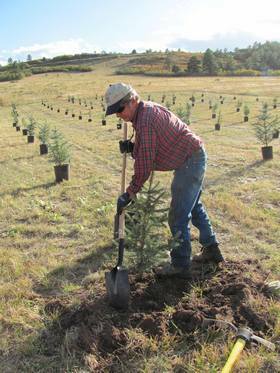 We have successfully planted many conifer species in difficult, arrid Colorado environments, even at our "high mountain desert" sawmill site on Rosita Road where there are no natural trees. Here we get only 12 inches of precipitation per year. So how do we make it work? 1. 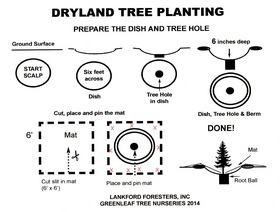 Install ways to catch water for each tree. This is the key. You can dig trenches with a tractor, planting in the lower part of the ditch. Or dig large circular "saucers" in the ground, berming 6" up in a wide circle around each tree -- the larger the circles the better -- we like four to six feet. Get the center of the circle to be 6" to 12" below what was the original ground level. 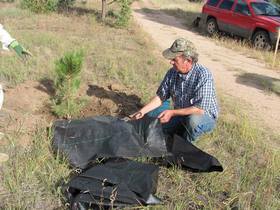 Then, when you can afford the material ($3 to $5/tree -- call us for source), add a "weed barrier mat" of woven landscape cloth, held down with turf staples, and slit-cut for the tree to poke out of in the middle . The idea is to catch rain .and snow, and direct its flow to the tree in the middle of the saucer/ mat. Think of how the water will be caught, and optimize the position of the saucer and mat. 2. Use existing drainages where water flows, even from roof edges or gutters, into trenches and over to planted trees. This may work especially well for more frequent watering needed for aspen trees. 4. Protect the newly planted trees, if possible, by fencing. This can be steel fence posts and chicken wire, up to 6 to 7 feet tall. The problem is that deer and antelope like to rub and chew on trees, so you need to deter them. This is less of a problem with blue spruce and pine trees. 5. Provide watering at initial planting, really soaking in the trees. Make sure to not expose the roots of trees during planting, and that there are no air pockets in the soil around the planted tree root balls -- good soaking and tamping will help prevent air pockets. Then provide supplemental watering for several years to new trees, whenever there are many weeks of drought or hot, dry weather in the summer. 6. We have found that other tree products, such as water-holding crystals or fertilizer, are not necessary. The main thing you need to provide is consistent water in most Colorado environments. 7. Finally, consider planting larger pot-grown trees. Greenleaf provides these from our own nurseries (see above) and we have found that the success rate over field - planted, smaller trees is much, much better. It is a way to have success at less cost!